Love Southerners… always finding a nice way of saying things… even cussing. 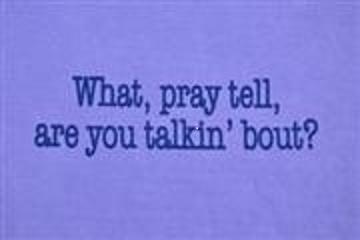 Instead of saying “What the hell are you talking about” (like I would, because there is always an inappropriate word coming out of my mouth) they say “what, pray tell.” Not only do they manage to change the phrase, they add in religion! Love it!